The flight of shuttle Discovery in October 1998 captured the public's attention with the triumphant return to space by John Glenn. The legendary astronaut became the first American to orbit the Earth some 36 years earlier. His 9-day shuttle mission focused on science experiments about aging. This post-flight presentation of highlights from the STS-95 mission is narrated by the astronauts. Air traffic controllers and meteorologists in Japan have a new tool at their disposal after today's successful launch of a new satellite that will conduct a dual mission to serve both communities for the next decade. As the second member of Japan's Multi-Functional Transport Satellite fleet, MTSAT-2 will join another craft launched one year ago to aid in air traffic management and weather forecasting throughout the eastern Asia and western Pacific regions. 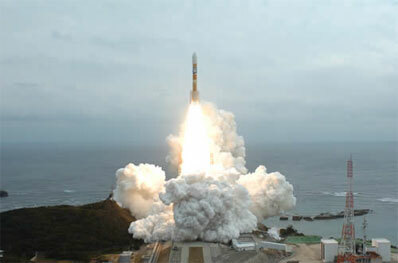 MTSAT-2 was delivered into space by an H-2A rocket that lifted off from the Yoshinobu launch complex at the Tanegashima space center on the southern end of the Japanese island chain. Launch occurred at 3:27 p.m. local time, or 0627 GMT (1:27 a.m. EST). The final countdown ticked along as planned, and every milestone was successfully completed near the slated time. The 174-foot tall launcher rolled from its integration building to its seaside launch pad about twelve hours prior to blastoff. Fueling of the first and second stages with liquid hydrogen and liquid oxygen propellants was finished with six hours to spare. In addition to the core two-stage vehicle, the mission required the maximum of six solid rocket boosters to deliver the 10,000-pound craft into orbit. Officials say MTSAT-2 is the heaviest individual satellite ever launched by Japan. After tracking southeast across the Pacific Ocean, the launcher's second stage released the satellite as programmed about 28 minutes after liftoff, and a ground station in Chile received the first signals from the new spacecraft ten minutes later. The rocket performed as expected and delivered the payload into geostationary transfer orbit. The planned orbit had a high point of 22,300 miles, a low point of 155 miles, and an inclination of 28.5 degrees. One of the first activities to bring MTSAT-2 online was to partially deploy the satellite's solar panel to produce enough electricity to charge the craft's batteries during the critical commissioning and orbit-raising phase. Three burns of an on-board kick motor will place the spacecraft into a circular geostationary orbit some 22,300 miles high within the next three days. In five days, MTSAT-2 should have fully extended its solar panel and antennas so it can begin a series of tests before being declared operational for the Japan Civil Aviation Bureau and Japan Meteorological Agency. Once testing is complete, MTSAT-2 will settle into its permanent parking spot in geostationary orbit along the Equator at 145 degrees East longitude, or directly over Micronesia in the western Pacific. Built by Mitsubishi Electric, the spacecraft carries Ku-band, Ka-band, and L-band instruments to help make air travel more efficient and safer in the Far East and along crowded trans-oceanic routes over the northern Pacific linking Asia with North America. The two-satellite MTSAT system is a critical part of a new air traffic control concept using space assets and relay stations to assist controllers in tracking and communicating with aircraft. The satellite will provide direct voice and data links from control centers to the cockpits of airliners - a vast improvement over the previous heavy reliance on ground-based antennas with limited range. The MTSAT spacecraft will also help enhance the navigation data gathered by Global Positioning System satellites, and automatically transmit that positioning data to air traffic controllers using its data relay capability when aircraft are beyond the range of radar sites. During the ten-year mission, the combined effect of these improvements should expand the airspace capacity across Japan and the adjacent waters of the Pacific, where crowded skies have caused difficulties for controllers. Precise navigation information will be available at air traffic control consoles on radar screens, and direct communications will be more consistent between pilots and the ground. MTSAT-2's second operational objective is to serve as a weather observatory for Japanese forecasters. The new satellite's sensors will be in a backup mode until around 2010, when MTSAT-1R's meteorological payload surpasses its planned five-year service life. At that point, MTSAT-2 will assume a primary role in weather observations, with the older craft trading spots and entering a standby mode. The craft features an imager with five total observation channels - four in infrared and one in the visible wavelength. Upgrades from earlier weather satellites include twice as many imaging cycles, an improved ability to discern low-level clouds and fog, and making more accurate sea surface temperature estimates at night. MTSAT-2 will also collect weather, seismic, and tidal reports from remote observation posts for relay to central forecasting centers for analysis by scientists. Today's flight marked the ninth time the H-2A rocket took to the skies since it debuted in 2001, and eight of those missions ended in success. This launch used the "2024" version of the launcher with two large solid rocket boosters and four smaller strap-on motors due to the heavy weight of its space-bound payload. The contract for the launch of MTSAT-2 was signed in February 2003 between launch provider Rocket System Corporation and the craft's operators - the Japan Civil Aviation Bureau and the Japan Meteorological Agency. The H-2A rocket's next launch is currently scheduled for no earlier than July with a pair of reconnaissance satellites to replace those lost in the failure of an H-2A flight in November 2003. Within the next twelve months, two more H-2A missions are manifested with the ETS-8 engineering test satellite and another spy satellite twosome.